UPDATE March 17th Kobi Snitz was held overnight and has been charged with assault. He will be brought in front of a judge today. Two Palestinians from Bil’in and two Israeli peace activists were arrested today at Bil’in as the IOF stepped up their crackdown on peaceful protest in the village. Members of the Popular Committee Against the Wall in Bil’in Ratib Abu Rahme and Mohammed Katib, who has just returned from a speaking tour in the US, were taken to the police station with Israeli activists Kobi Snitz and Shai Pollack, who directed the film about the village’s campaign of non-violent resistance ‘Bil’in Habibti’. They were all released three hours later. Today’s demo marked the four year anniversary of the murder of American peace activist Rachel Corrie, who was crushed by an IOF bulldozer in Rafah, Gaza, whilst protecting the homes of Palestinians from demolition. Banners commemorated the anniversary. The marchers were prevented from reaching the gate in the Wall as the IOF erected razor wire around 200 metres in front of the gate. When the protesters walked around the wire soldiers pushed them back with their shields and batons. Eventually most of the protesters passed through and were grabbed and dragged along the ground just for being there. Despite this aggression not a stone had been directed at the IOF by this stage. When the crowd dispersed some stones were thrown at the soldiers, resulting in the indiscriminate firing of tear gas canisters and rubber bullets. Journalist Fadi Hamad from the Ramattan news agency was hit with a tear gas canister in the eye and was treated by medics. Journalists are injured most weeks at Bil’in. Tear gas was fired at the returning crowd even in the built-up part of the village. Altogether seven protesters were injured, with three hospitalized. They were later discharged. This week the Shabbak (Shin Bet – the Israeli internal ‘intelligence’ agency) made phone calls to members of the Popular Committee in Bil’in threatening to arrest, shoot or kill them unless the weekly anti-Wall protests stopped. They were also ordered to attend interrogations at a nearby military base. Leaflets were distributed in the village trying to dissuade villagers from attending the demos by dismissing the two-year long campaign against the Wall as ineffective and threatening to arrest those who invite Israeli and international peace activists to the demos. Villagers see this as merely the latest futile attempt to stifle peaceful protest to the theft of 60% of the village land for the illegal settlements. 2. Tanya Reinhart, a powerful voice has been lost. Tanya Reinhart died suddenly in New York last night, March 17, 2007. Reinhart received her B.A. and M.A. in Philosophy and Comparative Literature from The Hebrew University in Jerusalem and later became a professor of linguistics at Tel Aviv University. Reinhart’s thesis supervisor was Noam Chomsky. Not hard to imagine her special interest on politics and media of the Middle East. In this book, Reinhart delves into the root causes of the Palestinian/Israeli conflict, exposes the ways in which Israel has systematically worked to undermine the Oslo peace agreements, and highlights the connections between the Israeli/Palestinian issue and the U.S. War on Terrorism. Reinhart was a dedicated political and human rights activist, committed to a peaceful and just resolution to the Israeli-Palestinian conflict. Thank you, Tanya, for your amazing words, unforgettable humanitarian work, and commitment to peace and justice! The Jerusalem Magistrates Court convicted Wednesday Yifat Elkobi, resident of the Jewish settlement in Hebron , for inappropriate conduct in public and causing damage to the house of a Palestinian family in 2001. Elkobi recently made headlines when Ynet exposed an incident documented by B’Tselem showing her harassing a Palestinian family in Hebron. Justice Rivka Friedman-Feldman said that Elkobi’s actions were severe and that luckily she only smashed windows and didn’t cause any bodily harm. According to the indictment, in 2001 Elkobi was throwing stones at the homes of Palestinians in Hebron, damaging one house. The court sentenced her to four months of community service, a suspended sentence of 6 months and either a NIS 300 fine (about $71) or a 10-day jail sentence. She was also instructed to pay the Palestinian family NIS 1000 ($237) in compensation. In her ruling, Justice Friedman-Feldman wrote that Elkobi showed disrespect to the court and the judicial process during the trial, and that she still refuses to take responsibility for her actions. “Until today, Elkobi has only received light punishments. The severity of these actions, however, requires harsh punishment,” she said. 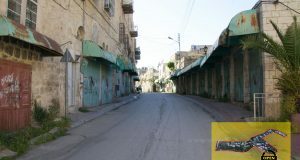 The Palestinian Popular Committee (PPC) for Hebron called a demonstration at 10 am today to protest the continued closure of Shuhada St., the main route through the city centre. About 30 people gathered in their offices and marched with flags and placards through the Bab Azzawiya market area to the Tel Rumeida checkpoint. They gathered there peacefully and listened to speeches from Azmir al Ajoun, other local representatives and representatives from Christian Peacemaker Teams and the International Solidarity Movement. Members of TIPH and EAPPI and various Palestinian groups including the Enlist for Peace Organisation were also present. The crowd moved right up to the checkpoint and spoke to the Israeli soldiers there who closed the checkpoint. Everyone then went back to the PPC offices for tea and a discussion. It was agreed that there is a need for unity between all the various groups resisting the occupation and that the struggle needs to be non-violent. At 12.55 pm a vehicle from Medecins Sans Frontiers was stopped by soldiers at the checkpoint. 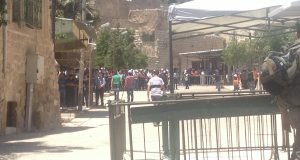 They refused to allow them to pass and visit patients in Tel Rumeida. They held them up for an hour and 20 minutes before finally getting the authorization from superior officers to let them pass. MSF say that they have been held up every time they come to Tel Rumeida since this group of soldiers arrived two weeks ago. Israeli workers were digging all day in front of the Abu Aisha house again. They were drilling into the foundations of the house. Apparently they want to install yet more CCTV cameras. Afterwards they dumped all the rocks and dirt from the hole on Abu Hamdi’s land. He is very upset about this but does not know what he can do about it. He argued with the JCB driver but got no response. 30 settler boys aged between 8 and 12 yrs attacked the Al Bayed family house on Shuhada St. with stones. They broke the glass on two solar panels. Human rights workers were called. They met 10 of the boys rampaging near the checkpoint and followed them up the hill to Tel Rumeida settlement. Some of them attempted to attack another house on the hill but were prevented by a soldier. Human rights workers (HRWs) from Tel Rumeida were asked to accompany a farmer and help him plant trees on land near Bani Na’im east of Hebron. The tree planning was organized by the Centre for Democracy in Hebron, working with Wa’ad. The land has three large water pools constructed by the Palestinian Authority for sewage recycling but never used due to settlers from the nearby colony of Pene Hever digging up pipes. The farmer is anxious to plant trees so that the land can be seen to be in use and will not be taken by the Jewish settlers. They planted 20 olive and 5 cedar trees on the edge of the land overlooking the road. There were no problems with the police or the army. In Tel Rumeida at approximately 14.30 some construction workers were working on the land between the Abu Aisha family home and the neighbor’s house which is a Jewish settlement. We were told by the workers that they were going to set up a CCTV camera there for the military post. There is already a CCTV camera not far away from there, which seems to be pointing towards the horizon. We were told that the work was to be done in a week. Later, another member of the Abu Aisha family was upset to find the same workers digging on the land in front of his house, apparently for the same reason. At 15.20 six Israeli soldiers were seen attempting to enter a Palestinian house on the hill. No-one opened the door and they left. They objected to being photographed. They then surrounded a Medecin Sans Frontiers (MSF) car and stayed there for a long time. The staff from MSF said that they had been hampered a lot in their work recently by the police and that they had been prevented from entering a Palestinian house that day. About 18.30 HRWs noticed a disturbance on the street down the hill. They went and discovered a settler threatening eight children with a gun. He claimed they had been throwing stones at him, which they denied. 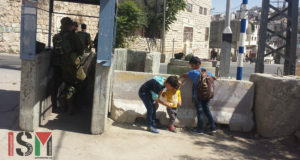 Israeli soldiers arrived very quickly and detained three children. They knocked on three doors but no one opened up to them. Police arrived 10 minutes later, talked to the children and released them. Coming back up the hill the HRWs noticed that two Palestinians had been detained by Israeli Border Police. The Palestinians said that the police had taken their IDs and demanded that they purchase cheap Palestinian DVDs from the Souk for them. One of them also claimed that the Border Police had taken his mobile phone and installed a virus on it. Now he would have to pay to have it repaired. A Palestinian HRW stopped the police commander who happened to be passing and made a complaint about the police behavior. The commander came over and gave the police a warning. It is surely a celebration. Everyone is bustling about, preparing for the day’s activities. But it is different than a typical celebration. Instead of carrying brightly colored drinks and holding plates of food, people are carrying shovels and pick-axes to plant seedlings as part of a plan to grow trees throughout the Jordan Valley. Palestinians consider trees as one of the most effective weapons against the Israeli occupation. In the eastern heights area overlooking the isolated Jordan Valley, residents of several villages began this past Tuesday to plant different kinds of trees as part of the campaign “For a Green Palestine,” sponsored by a local foundation. The “celebration” was in full swing in the village of al-Aqaba, located at the head of the eastern heights of the Jordan Valley, and designated for demolition as part of settlement expansion. The residents are saying that they are planting trees as part of an ongoing popular resistance campaign. It is expected that more than 3,000 olive and evergreen trees, delivered by the Palestinian Organization for Development, Dialogue and Democracy – “Wa’ad,” – will be planted in different areas around Tubas and the Valley. The coordinator of the organization, Mahmoud Issa, said, “Planting one tree in an area threatened by settlements is the most effective weapon to face the Israelis.” He added that several areas targeted by the Israelis will be planted with olive trees. Rashid al-Debik, a local villager, was busy putting twenty seedlings in a cart, which he will be planting in front of one of the Israeli army’s bases adjacent to his village. He said that there is another forty dunums that he will try to plant if the Israeli army allows him to do so. Standing at the edge of al-Debik’s land, near a large hole dug by the Israeli army, one can see the vast area of the eastern heights. One man helping with the project said that one of the biggest problems he and others face is the shortage of water in the area. Mohammad Hussein Jaber and other men from his family are busy moving olive seedlings and evergreen trees. In an area nearby, a bucket-shovel begins working, easily breaking through the moist soil. In less than ten years, the village of al-Aqaba, which had been occupied by Israeli soldiers and military camps, became a village bustling with people and replete with trees. The head of the village council, Sami Sadeq, said that the residents took the decision to plant trees as a popular means of resistance. Sadeq is responsible for organizing the process of distributing the trees and planting them throughout the village. However, soldiers denied access to those planting seedlings in a number of other villages nearby without offering a reason. Residents of al-Maleh village in the Jordan Valley reported that soldiers on duty at al-Tayaseer checkpoint at the entrance of the Valley barred them from transferring 200 olive tree seedlings to their village. In that area, residents suffer from a shortage of water resources to cultivate land. The area is under Israeli control in accordance with the Oslo accords. Since 2000, Israeli forces have uprooted thousands of olive trees as part of its military policy. The construction of the wall has greatly damaged agricultural life in the West Bank, since wide areas have been confiscated or compromised by its construction. Reports indicate that the Israeli army has bulldozed more than one million trees in the past few years. No matter how bad things get in the North West Bank, it’s never as bad as in Hebron. I’m back in the ancient city exactly two years after my last visit. I participated in several solidarity actions, among them school patrol in Tel Rumeida. This small Palestinian neighborhood of Hebron is home to some of the most violent ideological settlers in the West Bank, who have moved into local homes by force and parade the streets with guns, terrorizing local residents including children on their way to and from school. The settlers in Hebron are here because they believe the city of 150,000+ Palestinians belongs exclusively to the Jewish people. Hebron’s were the first settlements in the West Bank after Israel occupied the area in 1967, when the Old City’s Palestinian population was around 7,500. Twenty-five years later, the population had shrunk by 80% to 1,500, a mass exodus provoked by Israeli settler and state violence and dispossession. The wealth left with the refugees; only the poorest residents remain, those with nowhere else to go. Their children dodge sticks and stones—from settler children (and their parents)—on their way to school every day as soldiers watch on indifferently; I and several other internationals accompanied the students to document and even shield the settler kids’ attacks. Today my station was on Shuhada St, which used to be a major Palestinian thoroughfare before settlers moved in down the road and blocked it to non-Jews. Cars drive frequently through the neighborhood but they are all yellow-plated (Israeli) or jeeps; Palestinians are not allowed to use cars in Tel Rumeida. They are banned from even walking on the main street, so they wind through a cemetery to get from their neighborhood to the city. More than 2,000 small businesses in the Old City and Tel Rumeida area have closed down, and the once thriving cultural and economic center is now a ghost town. From Abu Thelal’s home you can see the mosque and temple where Abraham was buried. The groves and ruins surrounding Abu Thelal’s home are not just old; they look and feel biblical. Cesca said she once watched in horror as settlers set fire to one of the hills during the Jewish holiday Lag Ba’Omer. She said they burned Palestinian flags along with the ancient land. Jewish holidays frequently translate into Palestinian suffering in the West Bank. This past week was Purim, so closure was imposed on the entire West Bank Palestinian population so that soldiers could go home to celebrate with their families. Extra help was needed patrolling today because it’s Shabbat, when attacks are more frequent because settler children don’t have school. I met the Abu Haykal family, who live literally next door to a military outpost on one side, and Tel Rumeida settlement on the other. Their windows are caged, much of their land has been declared a “closed military zone” (although settlers frequently trespass it without consequence), and they removed the staircase to the roof so that soldiers would stop coming to use it for surveillance. Settlers have done everything they can to scare away the family so they can move into the large well-situated house, but the family just won’t give up. The Abu Haykals have 11 children and have lived in their home since the neighborhood was Jewish, before Zionism and the Hebron Massacre of 1929 (again, see previous Hebron update for elaboration). Settlers claim they are reclaiming Jewish territory, yet the families who left have issued joint statements demanding that the settlers leave and stop all violence against their former neighbors. To add insult to injury, the Israeli Army has been demolishing Palestinian structures across the region, most of them homes and bathroom facilities. The pretext is that the shepherds didn’t secure building permits from Israel before building the rooms and outhouses on their own land. Building permits are expensive (up to $20,000), and generally refused to Palestinians. In contrast, they are readily available to Jews who want to build homes, even on land that does not belong to them. The caravans of violent settlers who have snuck onto Hebron hilltops, surrounding the rural families, are meanwhile encouraged to flourish with subsidies, infrastructure, and protection from the Israeli state, even though they are illegal according to international and Israeli law. Hundreds of rural Palestinians’ homes and caves have been bulldozed, and many families have fled in an exodus that can only be described as ethnic cleansing. Still, several villages remain, despite tremendous obstacles, refusing to leave their ancestral land. One such village is Qawawis, where I spent the day rebuilding homes that the Army recently demolished. Organized by Ta’ayush, a joint Jewish-Palestinian human rights group from Israel, dozens of Israelis, internationals, and Palestinians came together to build foundations, stone walls, and rooftops for the four rural families of Qawawis and other nearby villages. We mixed cement, formed assembly lines, and broke bread together throughout the beautiful exhausting day. When we were finished I headed back to Hebron. Re-entering Tel Rumeida, soldiers searched my bag and person for weapons. Beyond the checkpoint I could see settler children and their parents carrying M16s home from synagogue. I reflected on the irony of being checked to enter a street where armed fundamentalists known for violence are granted virtual impunity. This trend of cooperation has been true for administrations of both major Israeli parties. As the foreign minister under Yitzhak Rabin’s first government, Yigal Allon of the “left-wing” Labor party offered substantial political support to settlements in the east Hebron area, trying to prevent Palestinian development in sections of the West Bank that were to be incorporated by Israeli according to the Allon Plan. Having too many Palestinians on certain coveted sections of the West Bank could threaten the “Jewish character” of Israel when they were eventually annexed. Of course, Hebron’s radical settlers have generally been allied with the right-wing Likud, which along with Labor has facilitated the settler strategies of establishing facts on the ground and attacking Palestinian residents. Israel has stationed 4,000 of its soldiers at checkpoints and military outposts throughout the city of 150,000 in order to protect the 500 settlers. Palestinians are closely monitored while soldiers frequently fail to intervene in settler attacks against Palestinian civilians. In addition, the Army often imposes curfew following settler attacks so that the settlers won’t fear retaliation. Curfew only applies to Palestinians. Their Jewish neighbors, who often perpetrated the crimes prompting the curfew, are free to wander through the Palestinians’ streets and land. Sitting around the dinner table at night, I kept thinking about Nablus. Jewish fundamentalists once tried to set up camp in Nablus city but they were driven out by the city’s armed resistance. It was one of the few victories of the Second Intifada. What would have happened if the people of Hebron had taken up arms back in 1967 when the settlers arrived? Nablus fighters are called terrorists, and Hebron’s would surely be as well. Still, knowing now what wasn’t known then, could we really blame them? These were the thoughts swirling through my head tonight as I prepared to return to my relatively peaceful existence in Haris. Walking through Bethlehem yesterday I was stopped by a taxi driver I have come to know over the years, Abu Anwar. He seemed agitated and angry. He knows of my work over here and was keen for me to go back to his house to show me what had happened during a surprise early morning visit he had received two nights earlier. Abu Anwar and his wife life with their five children in a small house in Doha City, a relatively new city, effectively a suburb of Bethlehem, that has grown rapidly as there is little land left in Bethlehem itself for development due to the Apartheid Wall and Israeli colonization. They have three daughters and two sons. I have visited their house before, socially, as is the custom in Palestine, to drink coffee and talk. The two young children cowered away, then, as the soldier entered the bathroom they ran out to their mother, looking for safety. She pulled them close to her. Their other two sisters were also in the living room and all the family stood close together. As the soldiers were spreading out through the house all the family was ordered outside to join Abu Anwar. Sound bombs were being thrown all around the house. As they walked down the stairs and outside they saw soldiers everywhere. Their garden was full of IOF, all with their guns trained on the family members. The neighbouring houses and the roofs of all surrounding buildings were also covered with these violent intruders. IOF Jeeps were spread all over the road blocking it, with their soldiers everywhere. Quite what was meant by this comment no-one is sure. But what is certain is that all the family were terrified, the children screamed hysterically. In the entrance hall all the boxes which had been stacked together filled with assorted toys, pots and pans and other household goods were scattered all over the stairs. As they went up the stairs they found smashed windows all along the way, one which looks as though it has been shot through with a bullet. At the top of the stairs next to the entrance to the living room is a sofa, they found it broken and cut to shreds with a knife. As they walked through the smashed door into their living room they saw the family computer lying on the floor, its hard drive removed and wires extruding. The sofa and chairs in here were also all damaged and had clearly been cut with knifes. The refrigerator was wide open, its door broken and food strewn all over the floor. The table and chairs where family meals are shared were all broken. Underneath the windows concrete is cracked and plaster is falling out after what must have been damaged with considerable force. The washing mac hine stands smashed and unusable. Children’s toys litter the floor, plastic cars and toy soldiers crushed, a large fluffy white bear has knife marks right down its back and its stuffing pulled out. Next to the front window a religious text has been ripped off the wall and the plaster behind it smashed and dug out with something. In the bedrooms all cupboards and wardrobes were lying prostate across the floors and their contents strewn everywhere, beds were turned upside down and mattresses slashed. On the top floor of the house, which leads out onto the roof, they find more of the same, smashed windows, storage boxes upside down and their contents thrown everywhere, and a new water storage tank, recently fitted to the roof, now full of holes and useless. The family later discovered that other family members in the neigbourhood had received similar visits. Four houses in all had received this disgusting treatment. Around twenty jeeps had been counted up and down the street and an estimate of somewhere between fifty to eight soldiers were reported by witnesses. Anwar was the only person arrested but dozens had been terrorized through the night, including many young children. Um Anwar shows me the footage she recorded on one of her daughter’s mobile phones. The film shows the destruction immediately as they returned to the house. Being shown round the house I can still see all the damage but things have been cleared up off the floor. The family have received similar visits in the past. Anwar was arrested previously in 1998, when he was just 15, that time it was two years before he saw his family again. He was also fined 10,000 NIS (well over $2000) and banned from leaving Bethlehem or passing any checkpoint for five years. He was charged with stone-throwing but has always claimed his innocence and at the time all of his friends went to visit Anwar’s parents to say it was not true. Um Anwar also shows me video footage of an incident that happened in December when a man was shot by invading IOF forces outside their home. With an IOF jeep parked across the road Anwar was ordered from his room at gun point and told to carry the injured man over to the jeep. The footage shows Anwar attempting to lift the man who is much larger than himself. He is clearly struggling with the weight as he drags the man through a pool of his own blood towards the jeep. Anwar’s parents found out through the Red Cross that their son is being held at Acion detention centre. They still do not know if he is actually being charged, and if so with what crime. It’s been a week since I returned home here to Palestine. And it has been four years since a twenty-three year old American peace activist, named Rachel Corrie, was killed by an Israeli Occupation Forces bulldozer in the Gaza Strip. And then Israel came to bulldoze a house in Rafah, the town where Rachel was staying. Unfortunatley, the house of the civilian Palestinian stood in the zone of Israel’s Wall. Israel claimed that under the house, Palestinian militants were using tunnels to smuggle weapons from Egypt. No tunnels have been found. So, Rachel, with her bullhorn and bright orange jacket stood affront the house. And chills go through me every time I think about what was going through her mind at that time. But the bulldozer didn’t stop. Instead, the bulldozer, manufactured and distributed by the American corporation “Caterpillar,” moved forward. The Israeli driver did not stop for her screams. He did not stop for her bright orange jacket or when the other human rights volunteers rushed forward, flailing their arms. No, the driver buried her underneath tons of steel and earth, and then wheeled the monstrous Caterpillar back over her, crushing her for a second time. Yesterday, in the village of Bil’in in the West Bank, there was a small vigil for her in commemoration of her life and resistance. Bil’in has a wall running thourgh it, separating Palestinians from their farmland. 60% of the farmland has been annexed into Israel due to this Wall. For over two years, Palestinians, Israelis, and international non-violent activists have demonstrated in solidarity against this Wall. Banners in honor of Rachel were seen scattered throughout the demonstration. We marched to the wall where the Israeli Occupation Forces were waiting for us, as they usually are. The tactics they use to our non-violent demonstrations vary. Some walked past the razor wire to get closer to the farmland on the other side of the Wall. Others stayed back. The IOF responded by beating people with their batons and pushing demonstrators to the ground or dragging them along it. After the fog from the tear gas, sound bombs and rubber bullets cleared, it was realized that four people had been arrested, including Palestinian and Israeli demonstrators, and 7 were injured, including a Palestinian journalist. Another peaceful demonstration achieving a violent response from what Israel calls their Israeli “Defense” Forces. But those who are living under Occupation and those who come to witness see their true colors. Rachel saw this in Rafah four years ago. And those of us here now, continuing non-violent resistance to the longest-standing Occupation of our time, see these crimes. And many wonder when the rest of the world will realize that their luxury comes at a heavy price to others across the world. There has been no justice for Rachel to date. And the crimes against the Palestinians continue to multiply as the international community turns its back. After the demonstration I headed down to Hebron. My eyes were stained with tear gas residue and the smell seeped from my clothes. But I wanted to end this day on a happier note, for Rachel, and for the kids in the Tel Rumeida neighborhood of Hebron who are living under Israeli military control, and whose neighbors happen to be the most right wing, extremist Israeli colonialists in all of the West Bank. So I met up with Katie to have our first TRCDP Reunion. The Tel Rumeida Circus for Detained Palestinians is a circus group that Katie and I co-founded last summer in response to the abuse and harassment placed upon the Palestinians in Tel Rumeida. The kids were so excited to see us back there to do our weekly Friday fire performances. Unfortunately, Palestine is squeezing out the last of its snow and rain and the show wsa postponed due to weather. Kinda’ hard to do fire performance in the rain. But we will be back, and invite all of you to come and see us, coming to a checkpoint near you!